Bervie defeated Banchory Boys Swifts 3-2 at Milton Park on Saturday to progress to the next round of the Raymond Kelly association trophy. Banchory are comfortably top of the B League and have a big strong team who battled hard throughout in what was a fairly scrappy game of football with several bookings. Bervie had the better of the first half and were using the width of the good quality pitch well to create space and chances with Turner benefiting from some good endeavour all round to score a 1st half hatrick. His first came in 5 mins from a Morris free kick on the right after Smith had been fouled, the cross into the box landed at Turners feet after a flick on and he hit it into goal from 6 yards at the back post. Bervie were getting joy down both sides and when the ball was played into the box by Collie in 26 mins Banchory failed to clear and in a bit of a stromash the ball broke to Turner for a tap in for his and Bervies second. The third came in 43 mins when a headed clearance from the Banchory defence fell to McHardy inside his own half who played a cracking long ball over the top and the Banchory keeper hesitated, allowing the ball to bounce and Turner to nip in and score for his hatrick. The game should really have been over as a contest at 3-0 but Bervie allowed a battling Banchory to have by far the better of the second half. 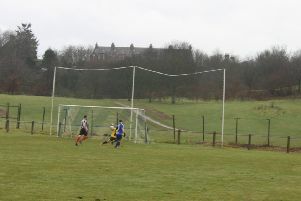 Banchory fought hard and rattled Bervie into playing at a frantic pace. Injuries to Salmond and Gordon disrupted Bervies back 4, with Boyd & Wood taking their places in defence and Banchory began to get lots of the ball in the middle with a number of free kicks being awarded and resulting in balls into the box. Banchory got one back after about 60 mins of the second half when they broke through the Bervie defence and ex Bervie player’s Anderson & Sawyer combining with the latter lobbing the ball over McNaught who had no chance. The game continued to be played at the same frantic pace with Bervie trying to push forward every time they had possession despite being ahead but often playing very loose passes in the final third and leaving themselves open to having too many players left up the pitch. It was from one of these situations that a mistimed tackle from McHardy gave a free kick away about 30 yards out. The resulting free kick was played into the back post and broke for Banchory to score a well taken second goal and bring themselves back into the game 10 minutes from time after McNaught was unable to hold onto the cross. A third goal eluded them though and to their credit Bervie didn’t panic. The reintroduction of McLaughlin up front and some good breaks from Montgomerie shifted the play into Banchorys half and Bervie retained their lead to progress into the next round.